According to reports, an UNORTHODOX ceremony was held last week. It was a wedding ceremony, where a man married the love of his life who recently died. 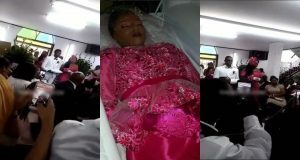 In the video, you see the beautiful bride freshly embalmed and in her casket wearing a beautiful red dress. Her husband is seen, wearing all white. And they had a full on ceremony with bridesmaids and groomsmen and everything. And while a posthumous wedding may seem strange – it really is quite common. A posthumous wedding is defined as a marriage in which one of the participating members is deceased. It is legal in France and similar forms are practised in Sudan and China. Since World War I, France has had hundreds of requests each year, of which many have been accepted. Thanks , I’ve just been looking for information approximately this subject for a long time and yours is the best I have came upon till now. experienced to reload the site many times previous to I could get it to load correctly.